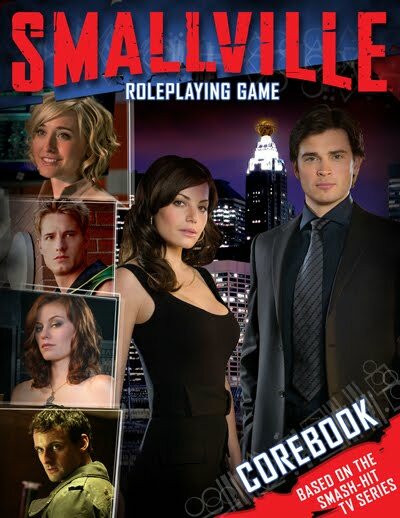 2010 was an excellent year for the role playing game player. Every niche of the market -- from indie to mainstream -- had significant offerings that are must have editions to the gamer's library. Some of the offerings premiered at Gen Con, the industry's equivalent of the CES, but others had their own release timelines and marketing schemes. These schemes alternated between viral pre-order campaigns to structured "in store" celebrations, but all of them were fun to watch. I have to say that while the past few years have had some great game offerings, 2010 was the first time in a couple years that so many games screamed out to me to actually play them and not just to read them and add them to my collection. So...what products made my Top 10 Role Playing Game products for 2010? 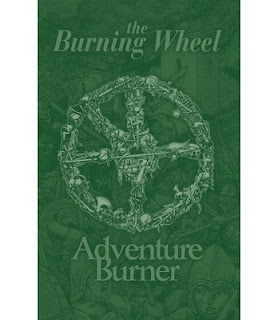 The Burning Wheel role playing game is a fine example of how the indie role playing game market is capable of making not only good products, but ones that shape the field as well. 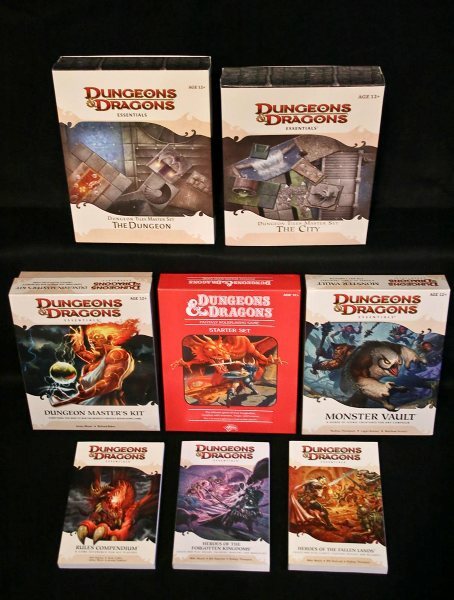 The game was first published in 2002 and some of its innovations found their way into the 4th edition of Dungeons and Dragons. The game is an rpg by game theorists and designers for game theorists and designers. That doesn't mean that the game isn't fun to play, it is, but it does mean that the way the game is presented changes the way you view other games and inspires tinkering. Once one has read The Burning Wheel books, one cannot read the Skill Challenges in 4e without seeing the game's influence on the hobby. The game encourages player to game master interaction in a way that some might find intimidating when used in play, but the rewards for doing so are grand. The only complaint fans of the game can legitimately voice is that the release schedule for support products is pretty slim, and adventure support had been non-existent. This year Jared Sorensen* Luke Crane, Thor Lavsrud, and crew released The Adventure Burner supplement for the game which contained three adventures to aid game masters in designing their own scenarios. Like all Burning Wheel offerings, this book has applications well beyond use within the Burning Wheel system. It is a must have product for game masters of any system, as much of its advice is universal in application. 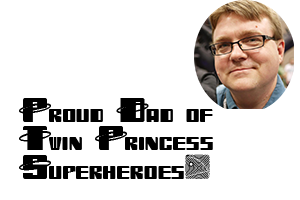 Paul "Wiggy" Wade Williams is one of the most prolific authors in the history of role playing games. More than that, he is one of the most consistently entertaining authors writing games today. One of the reasons for Williams' high output is his ability to take ideas from history/fiction/television and to transform them into his own interpretation. His Hellfrost campaign setting combines the dark fiction of George R.R. Martin, the Icelandic Sagas, Roman History, and Arthurian legend and is one of the best RPG settings available today. After I learned that Williams would be writing a game using the Ubiquity game system, most of his past work had been for the Savage Worlds game rules, I was intrigued. The Ubiquity rules system was created by Exile Games Studio for their excellent Hollow Earth Expedition game. When I saw that this game would be a swashbuckling adventure set in 30 Year's War France and would include Musketeers, Werewolves, Witchcraft, and Demons, I was sold. I purchased the volume at last year's Gen Con and was delighted by the product. If you loved "Brotherhood of the Wolf" or any of the Three Musketeers stories, but thought they would be slightly improved with the inclusion of the supernatural, then this game is for you. 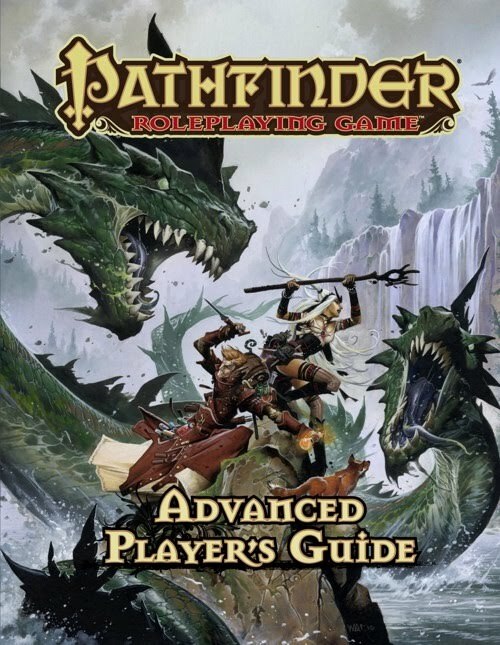 For fans of the 3rd Edition of D&D, Paizo's Pathfinder role playing game was a god send. Typically, when a company updates a rules set players are left with the decision to either grudgingly shift over to the new rules or to continue to play using the old rules knowing that they won't be receiving any product support in the future. This is even more the case when the rules update is so dramatic as the shift between the third and fourth editions of D&D. Thanks to the Open Gaming License and the talented game designers at Paizo Publications, this wasn't the case for 3rd Edition players. Paizo thoroughly, and publicly, playtested their adaptation of the 3rd edition rules and published them as the Pathfinder role playing game. The game is beautiful to look at and corrects some of the flaws of 3rd Edition, while only introducing a couple of its own. It certainly isn't a game that I would use to introduce people to role playing games, but it is one of the premiere games in hobby -- and for good reason. Last year Paizo released their Advanced Player's Guide which added new core classes and numerous options to the already robust game system. This is a must have for Pathfinder fans, and for 3e fans of all stripes. Paizo's work on this product is excellent. Dave Morris, Jamie Thompson, and Russ Nicholson are names that harken back to the Golden Age of White Dwarf Magazine, back before it became a house organ promoting only Warhammer miniatures. Toward the end of the gamebook explosion of the 1980s Morris and crew released a series of gamebooks under the Fabled Lands title. Six books were published, but only three were made available in the States. The books featured complex puzzles, a simple but robust game mechanic, and interactions between the volumes. Choices in one book could lead directly into another volume. Sadly, the market for gamebooks had dwindled by the time these books were released and they never caught on. Recently, there has been a resurgence of the gamebook market both in print and as applications on the iPhone/Pad. The Fighting Fantasy gamebooks are available as apps and excellent new offerings like those of Tin Man Games have emerged to create interest in the genre. 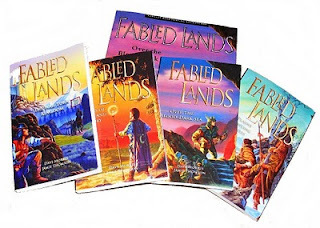 The time was ripe for the Fabled Lands books to reemerge and last Christmas they were republished by a company owned by the books' creators. Give these a chance. Based on Jim Butcher's New York Times Bestselling urban fantasy series Evil Hat Productions' Dresden Files rpg is proof positive that small independent companies can make games that look, feel, and play like those made by the big corporations. 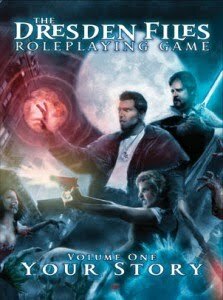 Dresden Files uses an adapted version of the FATE rules system to create an easy to play game that incorporates player involvement beyond mere character creation. The entire group gets together to create the setting, the stakes, and the opposition that will occur in the campaign. The systems are innovative and the planning sessions are as fun as typical rpg game play sessions. For years fans of the Warhammer 40K Universe have awaited a role playing game where we could explore our own stories in the Dark Millenium. 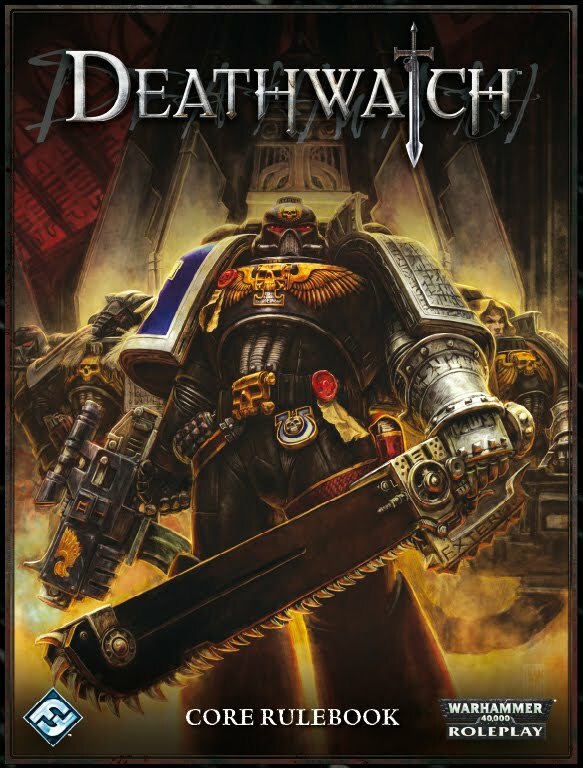 Dark Heresy satisfied that need for many, but for those of us who find 40k to be synonymous with "Space Marines" Dark Heresy didn't quite scratch that itch. 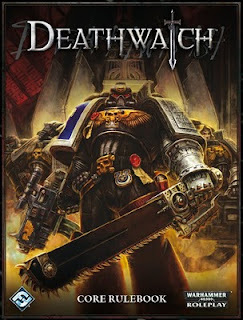 Fantasy Flight Games' release of Deathwatch satisfies that desire quite nicely. Now players who recreate tactical skirmishes on their kitchen table tops where Ultramarines face off against the terrors of the Warp can experience the struggles of the individual Space Marine as he serves the Emperor and protects the remnants of human empire. What more can you ask for really? A good rules system with a beautiful rulebook filled with detailed narrative information? Oh...this has that too. Now all I need is an Eldar 40K rpg and my world will be complete. For decades TSRs Gamma World has been a kind of awkward stepchild of D&D. The game has always had interesting ideas, and has had a couple of quality releases, but it never seemed to receive the corporate marketing support that it deserved. 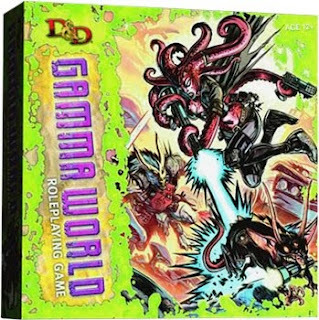 When Wizards of the Coast released the latest version of Gamma World, written using the 4th Edition D&D rules, they could have treated it as it had been treated in the past. They could have published a single volume with little fan fare, or released a game that lacked mechanical similarities to the company's flagship rpg. Instead Wizards created a product that they fully promoted that had monsters that were compatible with the 4th Edition rules set. They also released a game that is one of the most entertaining gaming experiences around. If you've ever wanted to play around in a post-apocalyptic wasteland as a Pyrokinetic Yeti, as a Telekinetic Plant, or as one of a number of other combinations, then this is the game for you. 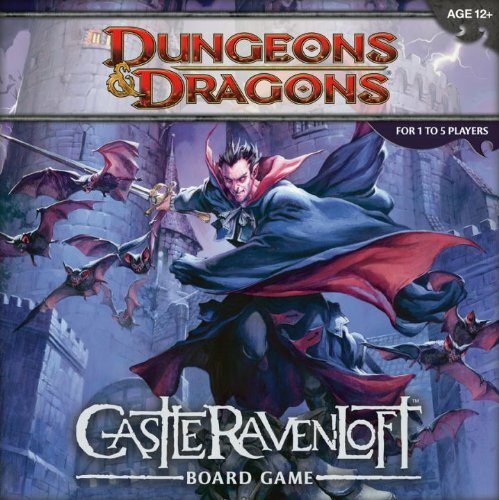 With Castle Raventloft, Wizards of the Coast managed to create an entertaining cooperative dungeon crawl board game that was also a perfect introduction to the role playing game hobby. As with super hero games, I am a dungeon crawl board game completist. When I purchased Castle Ravenloft, I expected it to be a good game, instead it was a great game. This is easily one of the best dungeon crawl games ever published. It is no surprise that the initial print run of the game sold out rapidly and forced Wizards of the Coast to delay the production of a similar follow up board game just to ensure there were sufficient copies of this game to go around. I bought this game for two reasons. First, I am a super hero game completist. I own every published super hero role playing game to date, and this was a must have for that reason alone. Second, Cam Banks was one of the lead designers on the game. Banks has done some excellent work in the past on Dragonlance game products, as well as on the Supernatural RPG, and I was interested to see how he would treat super hero soap opera action. The resulting game is one of the most exciting and innovative role playing games ever produced. From character creation to how the games mechanical resolution system emphasizes character's relationships to each other, this game breaks new ground in the role playing game field. The fact that it does all of this while creating a game that is easy to learn and understand due to its relatively simple mechanics is a wonder. If your mind was ever baffled by the concept of how a game could mechanically represent Superman while still providing mechanics that allow Lois Lane to meaningfully participate in play, then Bank's accomplishment with this game becomes even more clear. This is the first super hero rpg where playing a normal person is just as exciting and rewarding as playing the hero. Like Dresden Files this game incorporates player input in campaign and relationship creation. I had been on the fence about playing 4th Edition D&D. I owned the books, but I was more than content to play in my 3.5 Eberron Game and my Pathfinder game -- then came Essentials. I was intrigued by the nostalgia appealing new Dungeons and Dragons: Starter Set that was reminiscent of the Metzger edition of the old D&D Basic Set. I read the box and was impressed by the manner in which it presented the D&D rules, but I was disappointed by some of the small errors and typos. This all changed when I read the Heroes of the Fallen Lands and Heroes of the Forgotten Kingdoms books. These books presented the new 4th edition rules not merely in a clear and easy to learn format, as was intended, but in an entertaining way as well. The narrative text made these fun to read, and it's not an easy task to make role playing game rules fun to read -- especially D&D rules. The entire product line is worth owning and broke the final layer of resistance I had to playing the 4th edition game. I am now a 4e fan and regularly run an Encounters session at my local game store. For the first time in years, I cannot wait to see what product Wizards releases next. If you've ever wondered why D&D appeals to so many people, you cannot do much better than to start with the Essentials books. *[edited 1/7/11 9:31 am]Thanks to Anonymous for pointing out the error in attribution. I could blame my error on the fact that I have been enjoying reading/running Parsley games lately, but that would be lame. Luke Crane is the mad genius behind Burning Wheel (or is he?). As penance, I will be buying another set of the three core books. A big Wiggy fan, here, I've always loved his stuff. And yes a regular Pathfinder player. I've been a Dresden fan for years and I'm chomping at the bit for the chance to run it. Gamma World has been intriguing to me. But now from what you've said looks like I'm going to have give Essentials a chance. 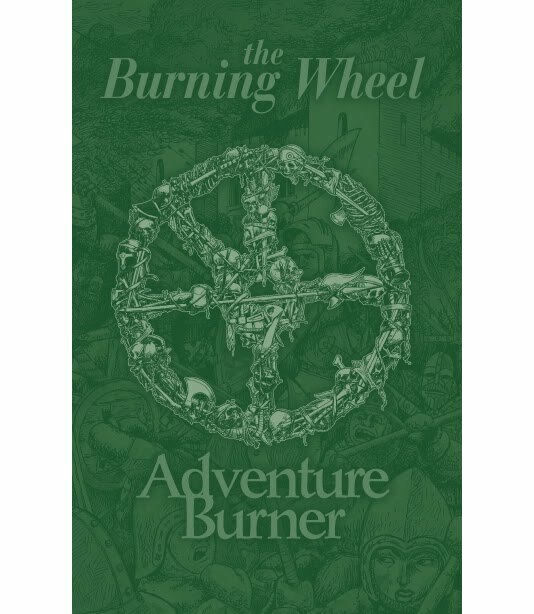 Thanks for the kind words about Burning Wheel and the Adventure Burner. Jared Sorensen, however, is not the author, publisher or designer of that book. Error corrected and apologies offered. LOL at first i was like Eh? These are some bizzare lookin mmorpg's..then i realized that they were actual real role playing games. I had totally forgot about those. Haven't played one in years.